Good bacteria are our friends. We need to protect them. 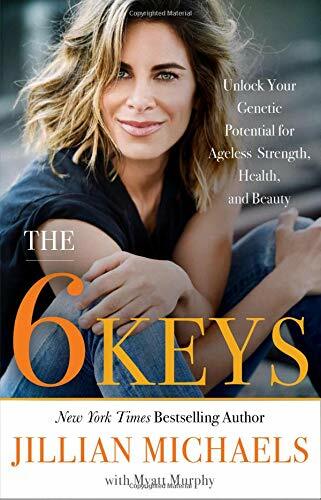 Jillian Michaels is a fitness expert and wellness coach with over 20 years experience, and is a New York Times bestselling author of numerous books including Master Your Metabolism, Unlimited: How to Build an Exceptional Life, and her most recent The 6 Keys: Unlock Your Genetic Potential for Ageless Strength, Health, and Beauty. Jillian's passion for fitness training originates from 17 years of martial arts practice in Muay Thai and Akarui-Do, in which she holds a black belt. Her first comprehensive 90-day weight loss system, Jillian Michaels Body Revolution, is available in retail stores across North America, and JILLIAN MICHAELS BODYSHRED, an intense group fitness class based on Jillian's highly-effective 3-2-1 interval system, is taught worldwide. Jillian Michaels: More and more these days we're hearing how important microbiome is, good gut flora, healthy gut bacteria so to speak. And then you've got probiotics, good bacteria, and prebiotics, which are essentially the nutrients for the probiotics. I have heard and I have read many studies linking healthy gut flora to everything from the inhibition of Alzheimer's to it being linked to autism in children to a healthy fast metabolism and on and on and on. And I remember years ago when I wrote my book Master your Metabolism, by the time we die, I'm trying to remember the exact number but I believe that like only one out of every ten cells in our body is even human anymore, like we have so much bacteria in our system. And this should be a good thing, but because we're over prescribed antibiotics and because so much of the animal products we consume that are non-organic the animals have been fed antibiotics because they're in horrendous feed lot conditions that make them sick and unhealthy, plus the antibiotics and their excrement runs off into our water supply so essentially we are being inundated with antibiotics from all different directions on a consistent basis and our diets are not well rounded enough that we're replenishing. So yet another reason where oh I don't do dairy. We can't make these unilateral statements. I do dairy. I do it if I'm following a calorie allowance and I'm having an equally balanced macronutrient ratio, how many calories of animal protein am I getting a day? At the most 600. So the dairy I choose is organic and it's fermented and I have a diet that's also very rich in soluble and insoluble fiber. So I'm getting my enzymes, I'm getting my probiotics and I'm getting the prebiotics to help keep the probiotics flourishing. More and more research nowadays links good gut flora to several health benefits, such as the inhibition of Alzheimer's to a fast metabolism. Since we're over prescribed antibiotics, and because much of the meat we consume comes from animals that were fed antibiotics, we are destroying much of the good bacteria, and often at the risk — because of our diets — of replenishing them. A well-rounded diet that's light in animal protein, high in macronutrients, and supplemented with a good intake of prebiotics can ensure we're keeping probiotics flourishing.